I have something different for you today. Instead of writing about the subject of record distribution, and how labels, distributors, and music retailers work together, I have come up with a True/False and Multiple Choice test for you to take. It covers music business issues and simple everyday music marketing ideas that you should know a bit about. I have ulterior motives for this approach. I am always amazed how many well intentioned, yet supremely business naïve, musicians exist in the world. For 15 years now I have been writing articles, columns, and books related to the business of music. I am hardly alone in this endeavor. There are now countless websites, publications, workshops, and conferences, (both online and off), dedicated to helping independent musicians learn how the music business operates. Yet countless acts try to establish themselves by remaining ignorant of how the distribution and selling of their music actually works. So, here is a test that will give you some very important clues about how the music business operates; as well as some insights into the preparation plans for marketing music products. I hope that it inspires you to learn more about the very business that will or will not help you sell the music you have invested so much time and money in. One of my best teachers in college told me once that he liked his students to feel somewhat intimidated about the subject at hand because he found that it made them pay more attention in class and more eager to learn. I hope this test has the same affect on you. The following questions are True or False statements, or Multiple Choice questions. 1. 'Marketing' is a term that describes when and how a product will be presented to consumers, and companies that deal with consumers, or music fans. 2. ___________ are businesses that service the record departments in national and regional mass merchandise stores, such as Target, KMart, and others. 3. _________________ means that product is placed in a music retailer where the consumer can see it easily, as well as purchase it at a price that will entice them to purchase it. 5. One Stop Distributors are a type of distributor that usually service non-music chain retailers, like mom and pop and alternative record stores. True or False? 6. 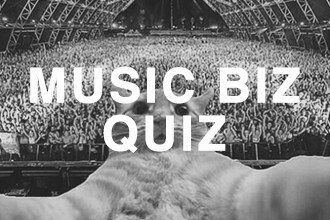 Which of the following persons is the main contact between a record label's distribution company and the record label?. 7. Label Marketing Reps are field representatives assigned to market all product that the label releases, or are assigned specific types of music to market. True or False? 8. A Label Marketing Rep for a major label may contact several dozen store buyers, clerks and store managers weekly. True or False? 10. ________________ is a distributor who sells labels which primarily are not owned or substantially controlled by the distributor. Generally they will maintain an inventory on the entire catalog of every label they sell. 11. When estimating how many CD's to manufacture, what percent of the initial pressing should generally be used for "free goods" to help promote the release? 12. An old saying about the music business is "Distributors "carry records', record labels "sell" records". True or False? 13. Sell Through is the point at which a record is bought by a customer from a retailer. True or False? 14. Sell In is the point at which a record is sold by a distributor to a retailer. True or False? 15. _______________is the term that refers to a commitment made by a retailer to purchase a certain amount of product in exchange for a media ad of some kind that advertises a particular recording on sale at a store for a particular price. 16. About 85 to 90% of record sales through retail accounts is done by 20 or fewer accounts. True or False? 17. In 2008 the record industry released approximately how many new releases? 18. The term 'incentives' involves deals offered to retailers in order to purchase recorded products, with either discounts. or delayed billing. True or False? 19. Labels usually introduce new artists to the public at reduced list prices. True or False? 20. An artist or band's name should always be near the bottom 1/3rd of a CD cover. True or False? 21. Always send out 'promo copies' to radio, the press, and distributors as 'cleans' (product that has not had the barcode area 'punched-out'). True or False? 22. "Dating" is the term used by a record label when working with distributors and retailers, to help retailers with the payment of invoices due for product sold. True or False? 23. Today because of increased use of digital releases there is no longer any need to make and sell a CD. True or False? 24. One of the best ways to digitally release an independent recording is to use the services of such web companires as Tunecore, CDBaby, or iTunes. True or False? 25. The first exposure that a gatekeeper in the music business has for a new release is the listening experience, or the music itself. True or False? 26. 'Non-traditional' music retailers (such as bookstores, and mass merchandisers) are no longer playing a significant role in the selling of music product today. True or False? 27. Barcodes must be on any music product that intends to be sold in major record chain stores or independent music stores. True or False? 28. Catalog numbers should appear on the spine of a CD/Record. True or False? 29. Independent labels usually want to affiliate with major labels so that they no longer have to worry about selling any of their product to distributors and retailers. True or False? 30. Affiliating with a major label can maximize the likelihood of the independent label getting paid for records sold, because the major label's distribution companies have the strong financial backing of their parent companies. True or False? 31. One question for an independent label to ask a major label when they are considering a business relationship with them is: "Will the major label distribute to mom and pop stores?" True or False? 32. The strategy of selling directly to a band's music fans over the Internet is best left to the major labels. True or False? 33. It doesn't matter if an independent label's personal style of doing business matches with the major label's style, because the major labels run their businesses more professionally than independent labels, and know niche music markets better than Indies. True or False? 35. Before entering into any type of deal with a major label, the independent label must check its contract with the artists on their label, to be sure they have the permission to do so. True or False? 36. In most deals between independent labels and major labels , the ____________determines how many records will be manufactured? 37. Social Networking sites like Facebook, Twitter, and MySpace have so many competitors online that they no longer have any value in marketing independent music. True or False? 38. "360" deals are currently the most common type of deal between indies and majors. True or False? 39. In a "360" deal the independent label usually retains control over the content of songs, the design, and copy of artwork, and the content of promotional and advertising material. True or False? 40. Designing a professional looking website is no longer necessary since the arrival of social networking sites. True or False? 41. Producers only receive a fee for their production services and do not receive royalties when recordings are sold. True or False? 42. A "reserve clause" is a clause stating that a portion of the records sold by a label to distributors and stores can be held back until the label is sure that they have all been sold before paying any royalties on them. True or False? 43. The artwork for a CD, and the graphics used to design an artist's website have no effect on the marketing of a recording. True or False? 44. Music Publishing is the same activity as music marketing. True or False? 45. A _____________is most likely to be the type of distributor who accounts for most sales of hit records once sales have topped the charts. 46. A distributor is more likely to get involved with an independent label when the independent label has a flow of new product going out into the marketplace. True or False? 47. In a Joint Venture deal, the major label fronts all the operating costs, and the indie and the major then share the gross profits of the joint venture. True or False? 48. POP's are bins full of low priced CDs placed at the end of a row of records at a record store. True or False? 49. Publicity, by itself, sells more music product than any other marketing activity. True or False? 50. Commercial radio airplay is easier to obtain these days than non-commercial or college radio airplay, or Internet radio airplay. True or False? Major League Soccer (MLS) & International Premier League - Indie Artists Pitch! All artists are given a free consultation on their first purchase with the company. Artist are given a free 30 – minute consultation in which the goal is to educate and give the artist the necessary links for artist to promote and set up and begin certain aspects of artist development. Artists is under no obligation to purchase these services to continue buying services when needed, but we do give the following. Our professional writers will draft a personalized, interesting and industry standard press release for you to make you look like a professional in the music business who is serious about his or her career and brand. An electronic press kit (EPK), often referred to as a media kit in business environments, is a pre-packaged set of promotional materials of a person, company, or organization distributed to members of the media for promotional use in electronic form. Having a professional website is still not in common in today's music industry, especially for recording artists, but that is exactly what separates you from your competition. In the digital music age, a blazing online presence will dramatically enhance the whole look of your persona, your image, your music, and your brand. An official website is the foundation of running your digital business and serves as a home base for your fans, customers, labels, sponsors and investors to get more information about you. Whether it's the latest news, new music or videos, a professional website is your direct platform to interact with users from around the world. This cost-effective service will make you look like a professional in the music industry by creating and designing a website, fully customized in every detail to your specific needs. Our Social Boost services are based on powerful viral marketing tools with a groundbreaking system that our professional staff uses to boost your plays and popularity. Not only do we offer our own PR, consulting and promotion based services, but we teach artist how to use the tools available around the web. We work directly with artist on established marketing platforms around the web that range from video marketing, online radio promotion, PR and promotion to advertising. Artist often benefit from these services the most because not only are they achieving the desired marketing and promotion results but learning how to use these platforms independently (if needed) in the future.